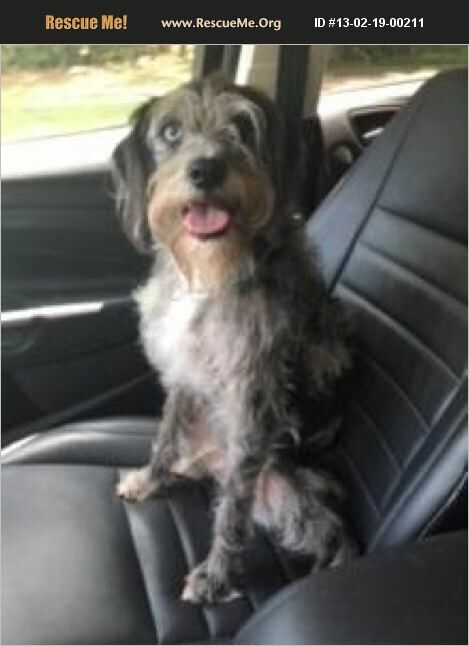 My name is Dexter, and I'm an ultra-sweet, lovable, scruffy 28-pound long-legged, blue merle Schnauzer/ Border Terrier mix with one blue eye who was born in December 2012. I'm a little shy and submissive when I first meet you, but once I get warmed up to you, I'm all yours. I haven't been around cats or kids, but I do great with other dogs. Of course, adult humans love me the minute they meet me! I'm finding myself in quite a pickle in that I was adopted when I was a 3 month-old puppy, but my human fell upon some hard times personally, medically, and financially, so she reluctantly returned me to Buster's Friends. She knows that they will find me a wonderful, new, this-time-forever home. And this is not the first time that I've been in a precarious predicament. Would you believe that I was rescued by Buster's Friends from the city shelter, where my littermates and I had been turned in as stray orphan pups? That was a scary place, and I'm so glad that my human didn't take me back THERE! I'm staying positive that an adorable bundle of love like me is going to be in big demand, once my one-blue-eyed face gets exposed on the web! So don't waste any time making arrangements to meet me. I'm ready to shower you with puppy kisses. Let's write a new chapter in our lives together! Dexter is updated on shots, neutered, dewormed, microchipped, and heartworm tested. His adoption fee is $150, cash or check payable to Buster's Friends. Please click the contact button if you are interested in Dexter, and we can arrange for you to meet him. To adopt one of our dogs, you must fill out our adoption application and be approved by one of our adoption counselors. To make the process more efficient, download the adoption application at http://www.bustersfriends.org/dogadoptionapplication.shtml. First save and then open it; then you can print it and fill it out.